With a 10cm x 10cm sensor... That's not really useful for musical apps. A full sized theremin with a range of about 50cm is very challenging if you want to do something else than sweeps. I plan to use the touch sensors to get a lot of parameter selectors (one sensor per parameter group). Once a parameter group is selected, I'll use 4 soft pots to enter the values that would be displayed on an OLED... no knobs, flat synth but fast access to the parameters. ah nice! curious to see this thing once you have it running. That's quite a sensitive device !! I've made one a long time ago but its range was about 30cm... good enough for sci fi effects from the 50s. I get my inspiration from the - underrated and forgotten - Akai AX80 : one button per parameter and a knob to change its value. I'd prefer to access instantly a page of 4 or 6 parameters. In my opinion, softpot (or capacitive slider) are faster to set than a knob: you press it where you want and that's it. The mpr121 allow to have a lot of buttons with relatively little effort and cost. With some tips, based on using two pads per touch zone, it may be possible to get more than 12 touch zones per mpr121 (30 or 36). Experimentation will tell me if it's really possible as soon as i receive the mpr121 breakouts. Something else i want to experiment is capacitive sliders. I wonder if they can be practically done with mpr121, in step mode or in "analog" mode. That would cost less than softpots and be more versatile. @deadsy, did you experimented these tips ? The electrode geometries I experimented with were fairly conservative. ie - finger tip size with touch on/off type functionality. I'm looking to make something akin to an omnichord strum plate. If you look at the driver you will see a table of config values in the *.axo that can be used to setup any of the registers of the device. In theory you should be able to tune different electrode configs without having to alter the core driver code. I have an incompatibility issue regarding .ram2 memory allocation. It seems that having a global .sram2 array conflicts with having them inside classes ?? I moved the include code into an axo file in a similar fashion to the OLED objects and it seems to work fine now but i don't really understand why it did not worked with the static mpr121 malloc function. Here's a fix - I'll check it in this weekend after I have tested it a bit more. // Allocate a 32-bit aligned buffer of size bytes from sram2. // The memory pool is big enough for 4 concurrent devices. Basically gcc doesn't want to assign two variable of different types to the same segment. Apparently pool and _rxbuf are considered different types because one is declared in a C++ class. But - If we say pool is in sram2.x - then that's a different segment so far as gcc is concerned. Fortunately the linker script assigns sram2. * segments to SRAM2, so we're golden. I have tweaked an experimental mpr121 object so that i can have a look at the filtered data. 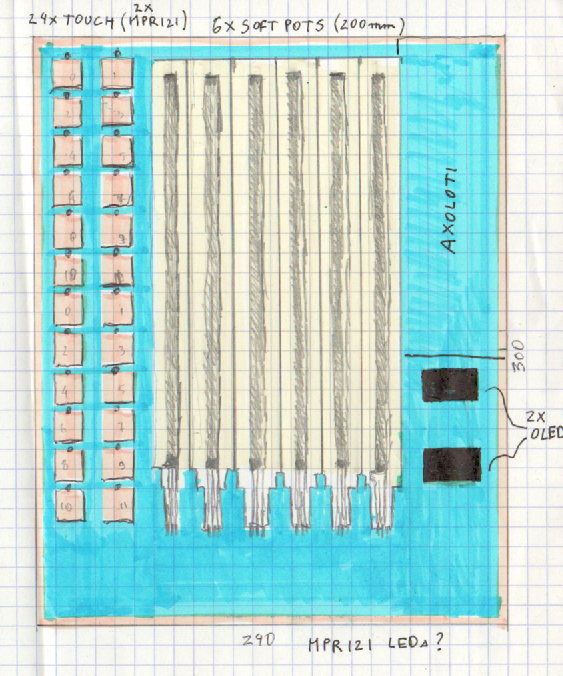 At the left is a diplexed keypad, it only needs 6 inputs for 15 keys, the trick is that some inputs are shared by keys. As far as i experimented, the sensitivity of the mpr121 allows this trick. On the right is a ~15 cm long slider... it will be more experimental as i want it to be continuous and only use 6 inputs (diplexing + interpolation). Yes, if it works it would be a low cost alternative to softpots. I experimented somewhat this afternoon. It is quite difficult to get it working, especially if i don't want to touch the electrodes directly. As I add some plastic film, the sensitivity is OK for normal use but it is slightly problematic with the diplexing trick and for slider interpolation. Maybe I need to find some really thin adhesive plastic film. apart from that, i ordered them from mouser or digikey, since i could not find a better source. if you find one, please let me know! I've ordered 5 x 200mm softpots from mouser right now (I already have one spare). just be aware, that softpots greatly vary from one to another in linearity etc. so best to use lookup-tables for each if you need uniform response from all of them. I will use them for data entry with an OLED that will display the values, I think that even a 10% deviation will be OK for that purpose. 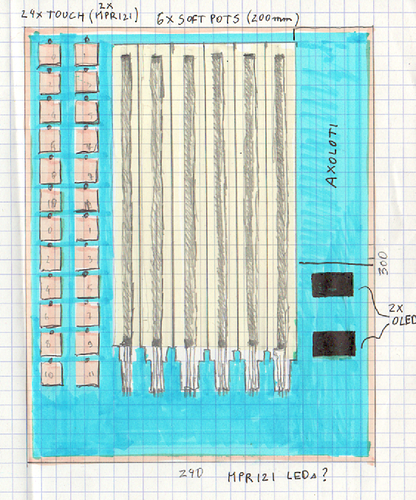 mpr121 would be used for 24 touch switches to select params and maybe control some leds. Here goes the "Fria synth" (named after queen Fria from Flash Gordon comics). great!! looks pretty great to me. how does the mpr121 behave? no "false" touches detected on any of the nearby fields for example? was it straightforward to set up? Yes, the MPR121 works quite fine. At the moment i have only one MPR121 (top 12 keys) and it is just under the touch pads (15mm 15mm each) connected with some wrapping wire no longueur than 50mm to avoid parasitic capacitance. The box is shielded with copper tape. To avoid parasitic capacitance with the shielding, i did not shielded near the touch pads. I covered the touch plates with a transparent plastic film (as used to cover/protect books). I experimented with thicker transparent plastic sheets, 1.25mm thick seamed to work fine.